Those chess pieces has same shapes and same form. So what's the different of those chess pieces? It was the main material. 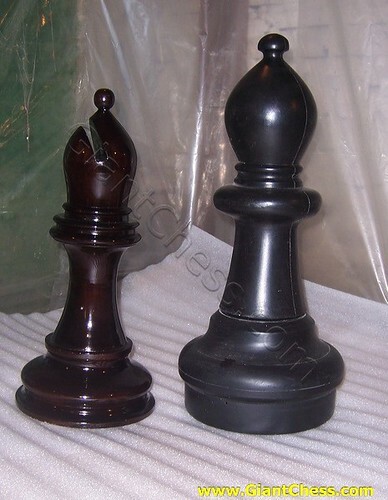 Those chess pieces has made of Teak and plastic material. It's mean that their difference is in the material use. Plastic is artificial; wood is natural. Plastic is not biodegradable over centuries; wood is. The processing of plastic releases contaminants into the environment; the cutting of wood does not. When purchasing products made of plastic, there are often hidden flaws that the buyer cannot discern; the same is not the case for most wood products, and especially for teak. Teak has both high artistic value and high practical value; while plastic is mostly known for its practical value. Teak wood of the finest quality, is not only known and prized for qualities, but also for its strength and resistance to wear in all seasons. Based on the reason, we decide to produce and carved all of our product from Teak wood material. This kind of main material more worthly and qualified than plastic. So, which kind of chess product that you wish for? We provide both of them.